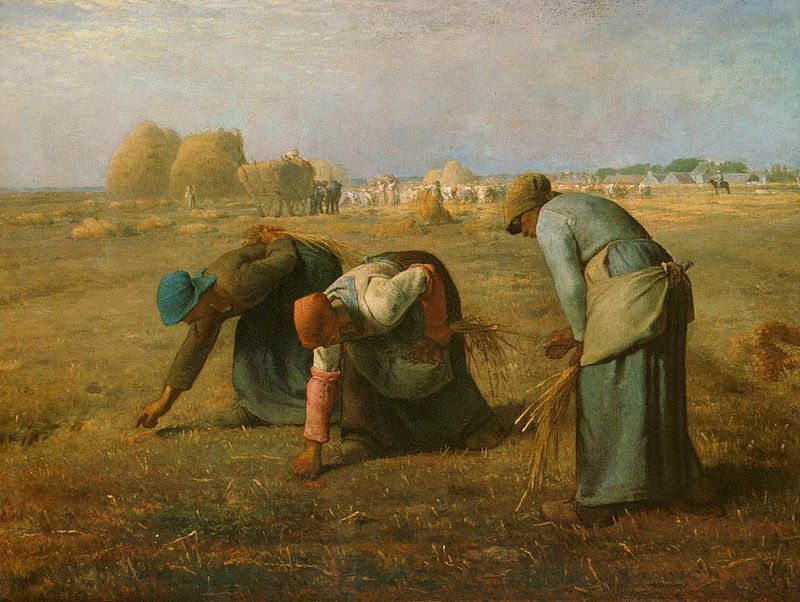 This cartoon makes use of Jean-Francois Millet’s The Gleaners and Jean-Honore Fragonard’s The Swing. The two paintings embody such perfectly opposing values – peasants/aristocracy, work/play, poverty/wealth, hard life/frivolity, barren earth/lush vegetation, etc – that they begged to be put together. The trick was to give them a context where this could happen. Some of you may be unfamiliar with allotment gardening. 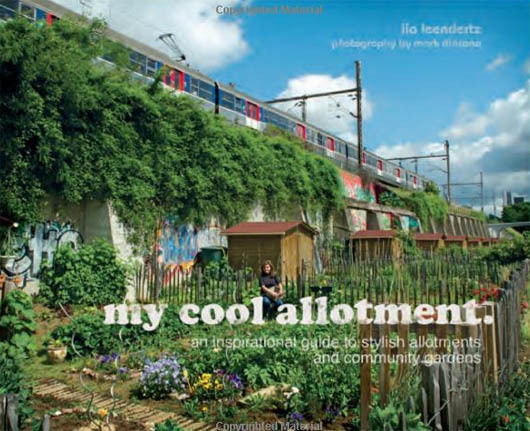 An allotment garden, often called simply an allotment, or a community garden (North America), is a plot of land made available for individual, non-commercial gardening or growing food plants. Such plots are formed by subdividing a piece of land into a few or up to several hundreds of land parcels that are assigned to individuals or families. Thank you Wikipedia. You can go now. As a newly landed Australian in London I was completely unfamiliar with the concept until I stumbled across one whilst trying to find the local estate agent. I just couldn’t figure it out. Peering through a wire fence I saw a bunch of people pottering around in little fenced off plots – in the middle of a medium-density residential area! What the hell were they doing? Was this a work for the dole scheme? A school for florists? Were they starving peasants? Gypsies? 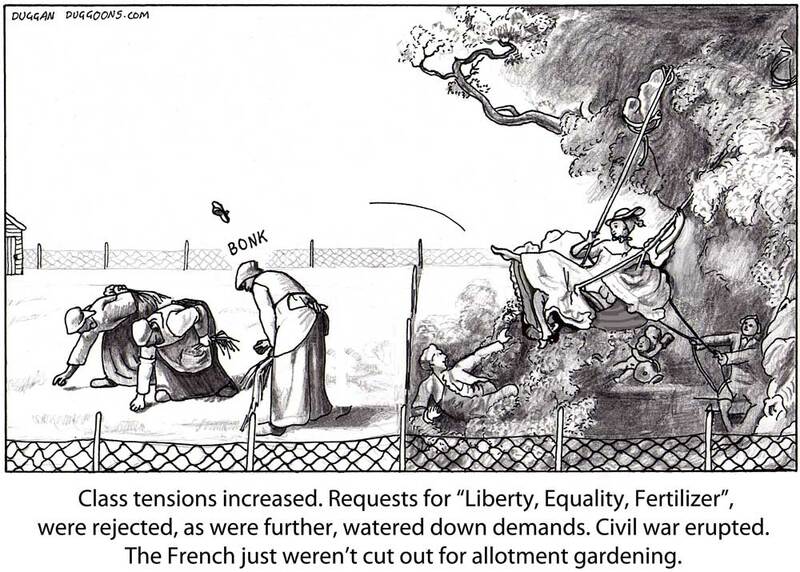 Squatting farmers undermining the legitimate carrot market? I had no idea. All I knew was that it was very suspicious. I rang the police and fled. Anyway it’s a very English thing. It’s certainly not an Australian thing and I hope, for the sake of the joke, that it never caught on in France. I confidently made that assumption without too much research. The allotment context seemed to me to be a tres amusing way to put the two images together. In Fragonard’s painting the lady is kicking off her shoe to her secret lover hiding in the bushes, whilst being swung by another man. She is also giving the secret lover a glimpse of her knickers. It’s very titillating. I’ve tried and tried but I just don’t find the Millet anywhere near as titillating. The flying shoe bonks the head of a gleaner, whom I do not find especially attractive, and the ensuing dispute between these allotment neighbours is the spark for the French Revolution.